• Just remember that there's a half step (1 fret), between B&C and E&F; all the other notes have a whole step (2 frets) between them. • Most guitars have markers on the fretboard (and dots on the side of the neck). On the low E string, G, A and B are usually on frets with markers. 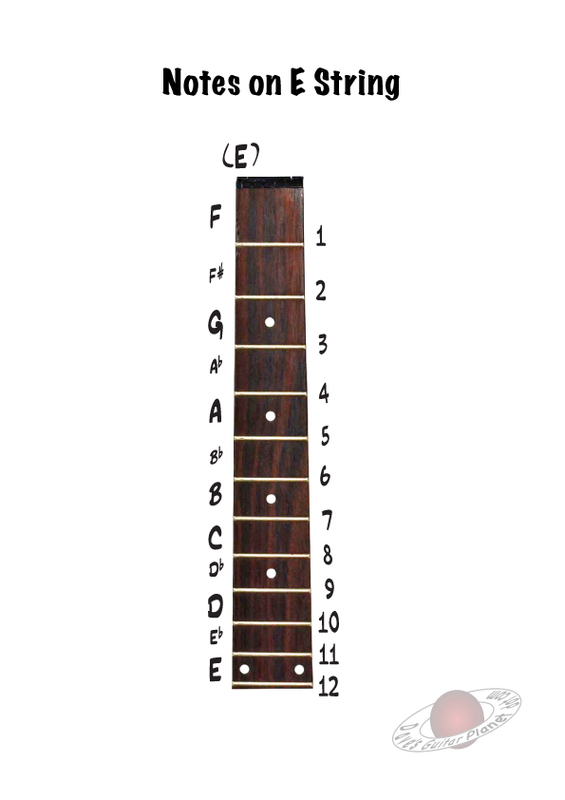 The 12th fret is the octave fret and usually has two dots or markers. • It's a good idea to just memorize the notes along the bottom E and A strings. If you know those notes, it's simple to find the names of notes on the higher-sounding strings. • On the D string, you can go down (toward the head), 2 frets, then down 2 strings to the E string. You can easily hear that they are the same note. • Because of the 'odd pair' (G and B strings), you have to go down THREE frets (then down 2 strings), to find the same note. Get some value out of this? Please donate.